The final event of the Professional Cross Country Club of Tasmania takes place this weekend with the Sea-Lyons Swim School 6km handicap at Burnie’s waterfront foreshore near the surf club on Sunday. The easy out and back course along the coastal pathway to Cooee will be a welcomed treat for most runners after the past fortnight of challenging races. Bryan Tuit is in great form and will be a major threat this week while Kyle Groenewege ran well last week without reward. Ann Horton had one of her best runs last week and the frontmarkers should enjoy this Sunday’s flatter going. Ricky Cross excelled on this course just a month or so ago and Mary-Lou Troughton is not without a chance. The penultimate event of the Professional Cross Country Club of Tasmania will be raced this Sunday as runners line up for the Somerset Pharmacy 10km race in Somerset. Somerset has become a real club favourite, the event boasting a series of tough, hilly sections and fast break-away flat segments. Startin g at Somerset’s boat play-area near the Murchison and Bass Highway junction the course incorporates a challenging layout of local roads to challenge runners of all capabilities. With the 2017 season drawing to a close Somerset should attract many fit runners clambering for a win as a reward their long months of training before the final race next weekend. Frontmarkers Ann Horton, Christine Wright and young Vicky Knapman have all ran well in recent races and appear set to win soon though Sunday’s hilly course may test them. Backmarkers Bryan Tuit, Kyle Groenewege and Isaac Troughton have been great performers and will be keen to do well before the season concludes. Aaron Robertson and Hayden Bishop both ran well last Sunday and both will enjoy Sunday’s challenge. Sunday’s race begins at 10am with registrations open at 9am and closing at 9:30am. A nominated time event begins at 9.15am. Following the excitement of the Feature Race last weekend, club members return to Burnie this week for the West Park Grove/Big Six 6 kilometre handicap. The race takes a circuit course from the Howe St Netball Centre and includes the steep hike up Brickport Road. With only this and two more races this season, members who have not had a win this year will be keen to break the tape. Following a top run for third two weeks ago, Kelly Baxter followed up with a great eighth in the Feature Race and looks to be the pick. After being close to winning several times early in the year, she took some time off to freshen up and it has worked a treat. Evan Brett looks the main danger. He has finished fourth in his last two runs and the tough hill will suit him down to the ground. Entries close at 9:30 with the race beginning at 10:30. Nominated time events will be held at 9:10. This Sunday the PCCCT heads to Gunns Plains for the Kevin Burn Memorial, Michael Wilson and Brown Family 11km handicap. Runners will be pleased that this year the circuit course can be used again following the rebuilding of Marshalls Bridge. There is some undulation on the western side of the river but no real hills meaning that some good times should be recorded. This is the last event before the Wynyard-Burnie Feature Race, Very keen racing is ensured as members will be fine-tuning for the following week with the knowledge that the winner will not be rehandicapped until after that big event. A runner who will be well suited to the distance is Isaac Troughton. He has been showing good form lately and will love these conditions. He will be challenged by John Saltmarsh who is running consistently and showing promise. Backmarkers Bryan Tuit and Brad Taylor will be hard to hold out. If a middle-marker is to win it could be any of Chris Purton, Ricky Cross or Lyn Saint-John, while the best of the front-markers looks to be David Wright. Race 22: Fish Frenzy 5km handicap. The fast and furious Fish Frenzy 5 kilometre handicap from West Beach is the next event for the PCCCT. This event will also incorporate the club’s 5 kilometre championships. With the Feature Race just two weeks away, runners will be keen for a solid hit-out and the racing is certain to be close and exciting. 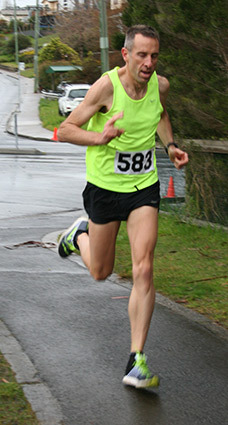 Shorter events tend to favour in-form front-markers and the one who could take this out is club president, Barry Ling. Ling is one or the few runners who began with the club in its first year, 1968, who is still competing. He is the club record holder for most starts with almost 1150. Although he is carrying a few niggly injuries these days, he has shown lately he is still very competitive. Seventeen year old Will Cleaver, in his first year with the club, impressed with his effort last week and will be hard to hold out, while Mike Taylor, John Purton and Mary-Lou Troughton also look like strong chances. The premier event of the PCCCT season – the Gowans Motor Group, Wynyard to Burnie Feature Race – will be held this Sunday. It will be the fiftieth running of the event and the presentations afterwards will be accompanied by displays and guest speakers to mark the Golden Anniversary of the Club. Many past winners of this event will be present to watch the race and join in the post-race celebrations. The race itself is wide open with many runners having excellent chances of breaking the tape. Among the front markers, Christine Wright, Kelly Baxter and Ann Horton will be hard to catch while the pick of the middle markers look to be Ricky Cross, Chris Purton, Sally Haynes and Lyn Saint-John. However the winner will most likely be one of the strong back markers as they appear to be best suited by the distance. Any of Michael Purton, Keegan Powell, Evan Brett, Thomas Wilson or Bryan Tuit could be first on to West Park. The race begins at 9:30, with back marker Brian Lyons away 1:06:55 later. The winner is expected to cross the line around 11:30. Here are important details about the Feature Race to note. Here are all the Feature Race results from 1968 until last year, compiled by Eric Hughes with assistance from Barry Ling. Thank you gentlemen. This Sunday the PCCCT conducts the fourth and last in its series of trail runs with the Motors 5km handicap at Fernglade. Runners are advised to wear their old shoes as the track promises many puddles and lots of mud. Some runners love this sort of terrain. One who does and looks to be a big chance is first year runner Owen Thomas. Spending his working days on a farm, Thomas is well used to the mud; however, he has the recent form to start favourite in this race. He ran an excellent third in the half marathon last week and has many other top ten placings in recent weeks. Kelly Baxter will be a big chance, returning to racing in good form after a short break. She looked close to winning earlier in the year and will be keen to break through before the end of the season. Other runners worth keeping an eye on include Barry Ling, Grant McCormack and Will Flynn. This Sunday the PCCCT conducts the AJL Lifestyle/AJJL Yamaha half-marathon – a much sought after race. The 21.1 is a classic distance and this version is run from River Park, Ulverstone to Turners Beach and return. The course is a flat one but requires contenders to have done solid training and be very fit. A runner who fits the bill perfectly is Evan Brett. Brett was noticed finishing hard two weeks ago for a close-up second and rested from last week’s event. His main danger is sure to be Matthew Rolls who has returned to the club this year, after a long break, in great form. He was fifth in a 12km event two weeks ago and has other recent placings. He won’t have to improve much to breast the tape first. Aaron Robertson and Brad Taylor will also look potential winners at some stage, while Kim Reader will fly the flag for the female runners. She is another who will love this longer distance but will need to be at her best to catch Anna Murton and Ann Horton. The Professional Cross Country Club of Tasmania returns to the hills this week, after a couple of flat runs. The Raymond Spinks/CRC twelve kilometre handicap is raced over a circuit course from the Somerset Soccer Club. Following a long uphill haul on the Murchison Highway to Village Lane the race continues on country roads before the final stretch along Cardigan Street. Matthew Rolls looks the likely danger. He has finished third and then sixth in his last two starts and won’t need to improve much to take this out. Others with strong chances include Lyn Saint-John, Isaac Troughton, Ann Horton and Bryan Tuit who won this event two years ago. The Professional Cross Country Club of Tasmania heads to Spreyton this week for the Spreyton Cider 5km handicap. This is the third in the series of four trail runs. The course will take competitors on an out and back course through apple and cherry orchards and on country tracks. The off-road runs have proven very popular and a large field is expected. This looks the perfect race for Alan Bakes. The septuagenarian showed some good form last week with an excellent second. He would not have to improve much to take this out. However, these shorter races are generally hotly contested and there are a host of other chances. Tobin Mason is a young runner who ran a great fourth last race and looks well suited. Liz Murton could fly the flag for the women while Dane Febey is getting fitter and could surprise. The contests for fastest times look to be at the mercy of Lyn Saint-John and Brad Taylor for the women and men respectively. Nominated time events will be held at 9:10.